The last conquest of a dying empire stands between two arms of the Shield Mountains. A province forged from necessity, its territory drenched in blood spilled across countless battles fought over the long years since mortals first stumbled across this land, the Borderlands of Tear stand as a reminder of the Empire that was and what could be once more. The Borderlands were a foreboding and dangerous place—a land that spawned hordes of beastmen, fell monsters, brigands, and far, far worse. Long believed cursed, it took the son of an emperor to bring the territory to heel and establish the rule of law, ensuring stability and peace, but now, with the Empire in turmoil, all eyes turn to the last heir who rules Tear for a way out of these desperate times. Borderlands of Tear examines a battle-scarred corner of the Empire, detailing its history, people, and places. Written by designer Robert J. Schwalb and illustrated by Svetoslav Petrov, Cecil Howe, and Jack Kaiser, this 12-page entry in the Lands in Shadows gives you everything you need to set your adventures in a wild and dangerous place! 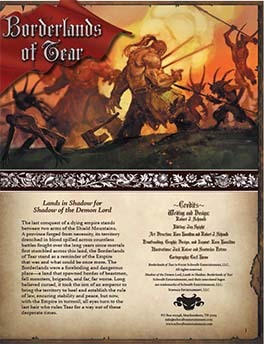 Buy Borderlands of Tear as a PDF from Schwalb Entertainment or DriveThruRPG!